[157 Pages Report] The Quality & lifecycle management software market globally is expected to grow at a Compound Annual Growth Rate (CAGR) of 7.4% from 2014 to 2019. The report aims in estimating the future growth potential in this growing Quality Lifecycle Management Software market across different types of business size, verticals and countries. Due to intense competition the complexities in the business processes and manufacturing are increasing day by day. This is due to the proliferation of the smart devices and products and demand of organizations for the low manufacturing cost and increasing demand in small and medium businesses. Various verticals are also there which are inclining towards the deployment of the Quality Lifecycle Management Software in their manufacturing processes, improvement in quality of product and share the exact data related to product throughout the cross functional departments and extended enterprises. QLM is necessary to manage the complexity and bring together multi-engineering disciplines and support product development in effective and efficient manner. The Quality Lifecycle Management Software market report gives the detailed analysis trends and forecasts, competitive landscape, key drivers, restraints and opportunities and analysis on Venture Capital (VC) and Mergers and Acquisitions (M&A) related to the Global market. It also focuses on technologies & standards and in estimating the market potential of the major sub-segments. Major solution providers in the people screening market are Autodesk, Oracle, SAP, Arena PLM, Aras, PTC and others are some of its major active players. MarketsandMarkets have segmented the QLM software market into solutions and deployment types. The report also focuses on various regional markets for these sub-segments. The global market segmentation is based on regions such as NA, LA, Europe, APAC and MEA. The QLM Software market is segmented based on product types, deployment types, organization size, verticals and regions. Quality is an important aspect of any product across its lifecycle, and key factor to the profitability of an organization. Manufacturers today can’t afford the risk and cost associated with poor quality due to the error in the manufacturing process or any other operation. Thus quality management software solutions include managing the quality of the product as well as the quality of product-related processes. This helps to reduce the cost incurred in rectifying the errors and cut down on time, to utilize it in time to market. Managing quality through manual inspection is not as effective as it used to be earlier, Thus it helps to reduce the risk to the cost associated with poor quality by the manufacturer. Various factors are responsible for increase in the use of QLM software, such as: proliferation of smart products, increase in demand of lower manufacturing cost, increasing adoption of quality management software by medium businesses and need to better manage the product portfolio are some of the major dynamics for the Quality Lifecycle Management Software market at present. The increasing adoption of QLM software by medium businesses is also one of the major drivers for the products in the Quality Lifecycle Management Software market. The Quality & lifecycle management software market globally is expected to grow at a Compound Annual Growth Rate (CAGR) of 7.4% from 2014 to 2019. In Asia Pacific and Latin America industries are flourishing at faster rate which will drive the QLM software market soon. North America is expected to have the largest market share, followed by APAC and Europe. These countries are technologically advanced and various implementations of QLM software and solutions are highest in these regions. Due to the growing demand of reduced cost and high quality products players may launch newer versions of QLM software with new capabilities which may drive the market later. The advancement in technology makes the availability of the software and applications on the cloud and on premise in various verticals such as aerospace and defense, automotive and transportation, consumer goods and retail, healthcare and life sciences, industrial production, high-tech electronics, telecom and IT and others. 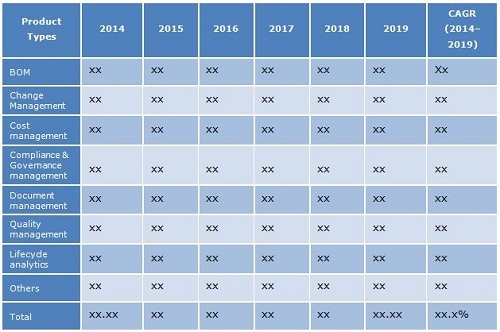 The table given above highlights the Quality Lifecycle Management Software market size by solutions from 2014 to 2019. The QLM software market in North America is estimated to grow from $14.29 billion in 2014 to $20.41 billion by 2019, at a Compound Annual Growth Rate (CAGR) of 7.4% from 2014 to 2019.